Nothing demonstrates the power of the sky to affect the Earth better than the daily ebb and flow of the tides. 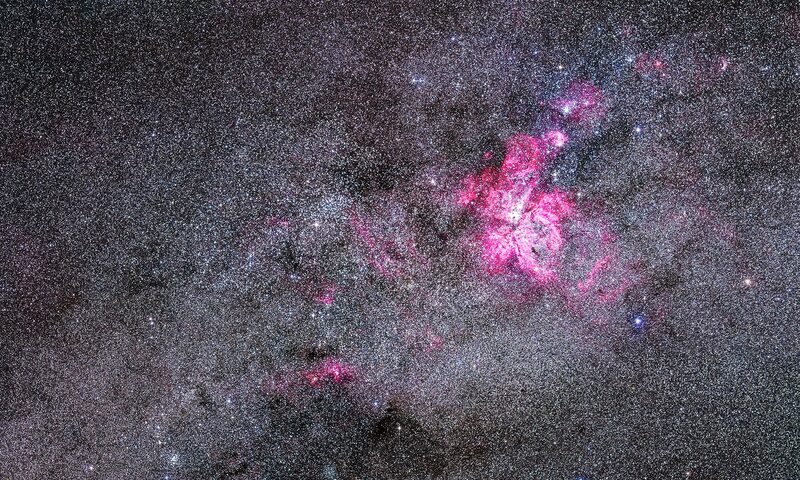 For a few days earlier this week I was fortunate to visit Nova Scotia, to speak at the annual Nova East Star Party. 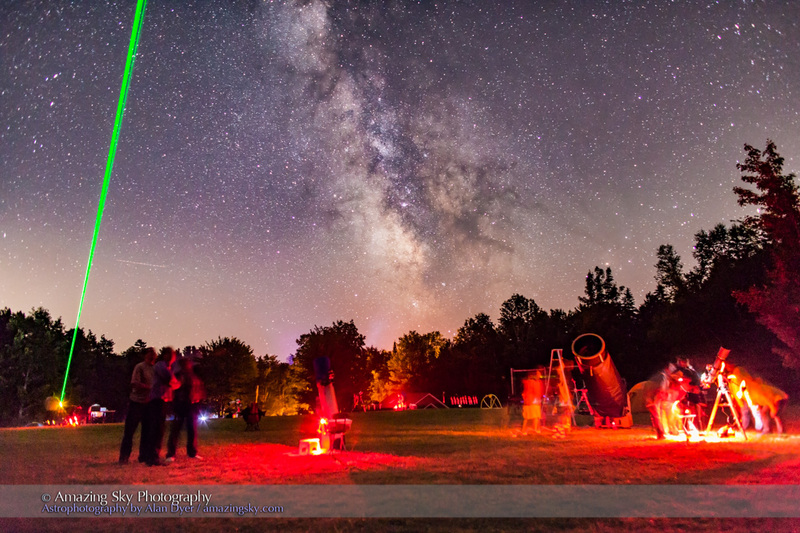 A scene at the Nova East Star Party near Windsor, Nova Scotia, in August 2015. I took advantage of my visit to Canada’s east coast to shoot time-lapses of one of nature’s most amazing phenomena, the daily pulse of the tides. The coastal regions around the Bay of Fundy, particularly on the Nova Scotia shore, and around the Minas Basin, experience the highest tides in the world. The range can be as much as 16 metres. Only remote Leaf Basin on Ungava Bay in northern Québec matches the Minas Basin for tidal range. The reason is not, as is sometimes stated, the funnel shape of the Bay of Fundy, but rather its length. It takes about 12 hours and 25 minutes for an ocean wave to traverse the length of the Bay, equal to the time between successive high tides. This creates a resonance, with the incoming and outgoing waves building upon each other and increasing the height of the twice-a-day tides. The amount of water moving back and forth is mind-boggling: some 9 to 16 billion tonnes of water flows daily into and out of the Minas Basin alone, enough to tilt the land. Evangeline Beach on Minas Basin, with vast tidal flats that are engulfed twice a day. And Halls Harbour on the Fundy shore, a great spot for watching boats go from grounded to afloat in just an hour or so. I timed my arrival at both sites to be there near lowest tide and shoot for about 3 hours as the tide came in, then stop shooting at about high tide. Luckily, high tide on both days was about 3 p.m. making for convenient shoots on a summer afternoon. Being just after New Moon, the tides were near their highest. Earth experiences two tides a day, at an interval of about 12 hours and 25 minutes, with the extra 25 minutes coming from the motion of the Moon around the Earth during that half-day interval. It takes another 25 minutes for us to line up with the Moon again. But why two tides a day? If the Moon pulls at our water why isn’t there just one high tide, when the Moon is highest in our sky? The Moon doesn’t pull on just the water. It pulls on everything. And it isn’t the Moon’s gravity per se that raises the tides, it is the difference in the strength of that gravitational pull across an object. The side of the Earth closest to the Moon feels the strongest pull, raising the tides on the side facing the Moon. But the Earth itself is also pulled toward the Moon, but to a lesser extent because the centre of our planet lies farther from the Moon. In effect, the Moon pulls the Earth away from the water on the far side of the Earth, the side away from the Moon. This raises a bulge of water on the other side of our planet, the side that feels the least gravitational pull from the Moon because it is farthest from the Moon. So as Earth rotates we pass through two tidal bulges, one facing the Moon and one facing away from the Moon. It wasn’t until Isaac Newton came along in the mid-17th century that we had an explanation for and an ability to predict the tides accurately. Even Galileo got it wrong. It was Newton’s mathematical explanation of how gravity fell off with increasing distance that led to an accurate theory of the tides. See Wikipedia for much more detail. The tree above is a direct descendent of the famous “Newton’s Apple” tree that inspired his theory of universal gravitation. 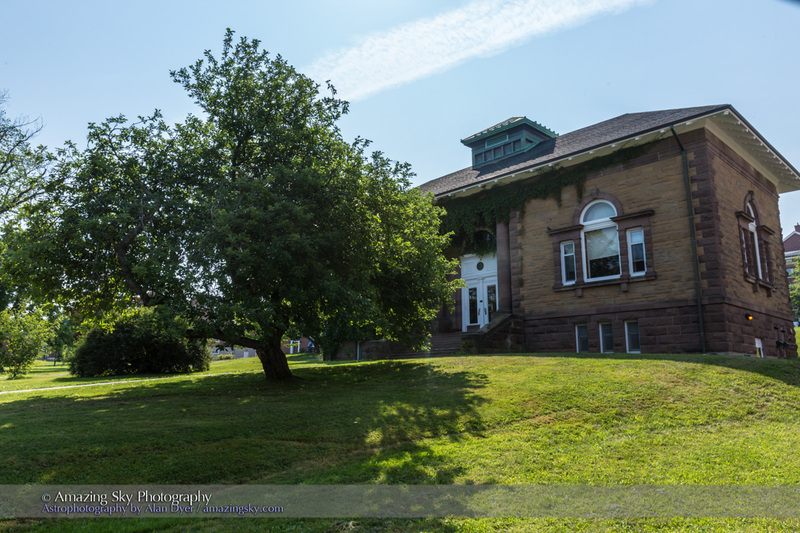 It is an apple tree on the picturesque grounds of Acadia University in Wolfville, Nova Scotia, and was grown from a cutting from the famous apple tree at Woolsthorpe Manor where Newton grew up and took refuge during the outbreak of plague in the cities. 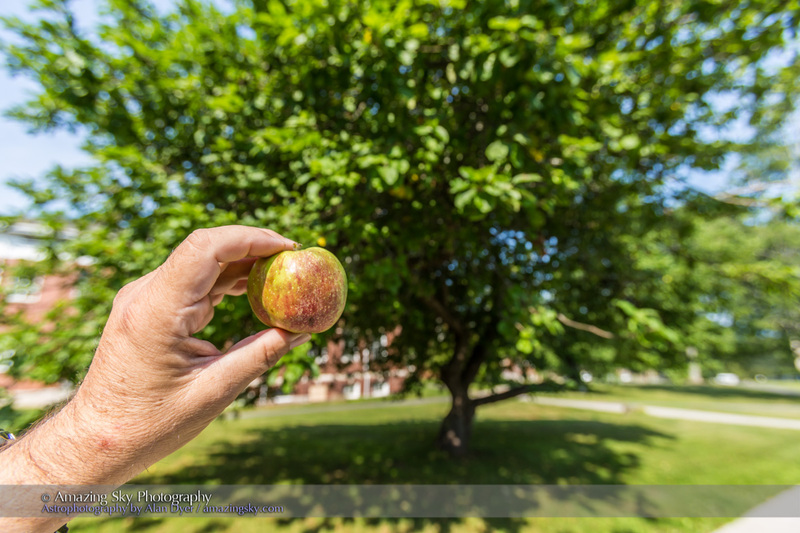 It was during this retreat that, story has it – a story told by Newton himself – that an apple falling on his head inspired him to wonder if the same force that was causing the apple to fall was also keeping the Moon in perpetual orbit around the Earth. 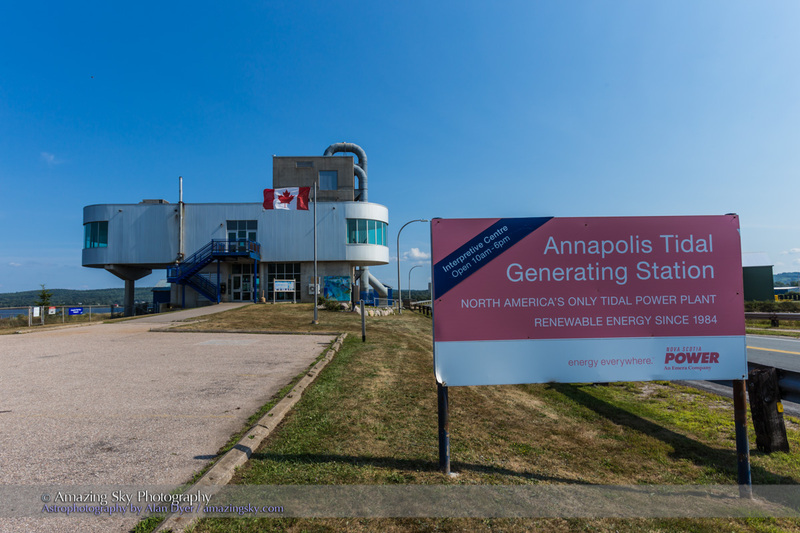 Today, we can turn the pull of the Moon into power, as here at Annapolis Royal where Nova Scotia Power operates the only tidal power station in North America, driven by water pouring into and out of the Annapolis River. The pull of the Moon here generates 20 megawatts of electricity. New submerged turbines are now being tested in the Minas Basin, using a variety of technologies. A previous underwater turbine at the same site was ripped to pieces by the force of the water. Harnessing the tides is not so easy. Tide watchers take note: The Full “supermoon” of September 27 (when there is also a total eclipse of the Moon) will be especially close. Favourable geometry will raise the highest tides in 18 years in the two days that follow the Full Moon. The Moon truly has the power to move the waters and the Earth. Many thanks to my host Dr. Roy Bishop for the tidal tour and elucidation. Click here to download an article of his about the tides. You might enjoy this video I made explaining tidal resonances at another location with incredibly large tides: the Bay of Saint-Brieuc in France.